Share your birthday ride aboard the Catalina Express! Travel for two with the purchase of one full fare Adult ticket. Travel to Catalina Island and explore deals and discounts from hotel stays to activities as you create memories together. The Birthday person must register online. You will immediately receive an email confirmation with your Birthday Pass. Before traveling, you must make your boat reservations for two online or call 800.995.4386. Your birthday promotion code, found on the Birthday Pass, must be entered for online reservations or mentioned at time of booking by phone. 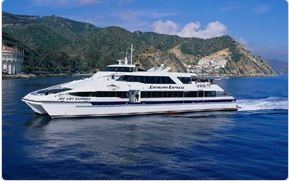 Print and bring your Birthday Pass with a valid photo ID to the Catalina Express ticket window on your Birthday prior to travel and hop aboard the Catalina Express to Catalina Island. Remember to download your Birthday Island Guide before planning your trip. Valid for round-trip travel for two with the purchase of one full fare Adult ticket on your Birthday in 2017. You MUST travel together round-trip. MUST begin travel on your actual birth date. You may return anytime within 30 days after your departure date. You must provide proof of your birth date and valid identification prior to travel. Valid photo IDs accepted are Driver’s licenses, State or Government issued photo IDs or government issued passports. If you are under age 18 and do not have any of the above, either an original or notarized birth certificate must be shown. School IDs or children security IDs are not acceptable. Photocopies, electronic copies and photos are not acceptable. Valid for general seating only. Upgrade options available to the Commodore or Captain’s Lounge, call for booking. No refunds, no cash value, non-transferable. Your valid photo ID name must match Birthday Pass. We agreed. Updated to 2017 offer. This was posted in 2013 for the 2013-2014 season… It’s now 2017…. Maybe it’s time to update the file???? ?